performance choreographed around a chef and sonified objects: fruit, vegetables, meat, knives, pots and pans, cutting board and table. Cooking*, the most ancient art of transmutation, has become over a quarter of a million years an unremarkable, domestic practice. But in this everyday practice, things perish, transform, nourish other things. Enchanting the fibers, meats, wood and metal with sound and painterly light, we stage a performance made from the moves(gestures) of cooking, scripted from the recipes of cuisine both high and humble. 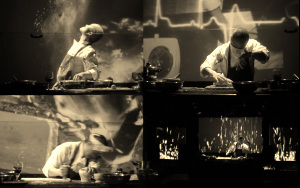 Panning features virtuosic chefs who are also movement artists, such as Tony Chong.Panning is the first part in a series of performances exploring how everyday gestures/events could become charged with symbolic intensity. The Department of Contemporary Dance in conjunction with the Departments of Studio Arts, Music and Theater, is proposing an innovative series: "Physical Lectures". Composed of a variety of experiential and innovative events designed to speak with the body about the body. Thus weaving expressions of body and thought together. Our goal is to shift the format of a lecture in order to edify an exciting type of somatic forum. Rather than creating artificial bridges between processes of the physical diffusion and written publication of knowledge, "Physical Lectures" seeks to fold the articulation of both physical knowledge and theory into a cohesive physical-intellectual experience. Questions around the topic of the body are: How is the body experienced, seemed, practiced, felt, thought, and discussed? How does experience differ from one disciplinary perspective to another?Could we change the way we talk about the body by speaking from it? And finally: Are these the questions that need to be asked or are there others that remain aside? By addressing these questions we intend to configure a platform for situating and displaying a panorama of research on practices of the body. Over the years a separation has developed between theory and practice that divides knowledge and its transfusion into categories of doers and thinkers. Discourses and practices around the body keep popping out in different disciplinary corners, yet interdisciplinary dialog seems to slip away from our current still isolated environments. We envision “Physical Lectures” as an urgent response to these conditions. From November 2013 to March 2014, interdisciplinary artists and researches will gather in 4 different physical lecture formats gather in the following clusters: The dark restaurant Onoir, a Tango lesson, a pool and the Labo Culinaire at the SAT. We envision these clusters as the master grid of events that will hold other tangential ones: a round table, an informal conversational, 3 public workshops and 4 workshops specially designed for the Concordia Fine Arts students population. Dances for small spaces is a series of movement poems based on the ideas and emotions brought to mind by the confines of the architectural landscape of the work. They are a play on the framed time of film and how the temporal reframing of gesture can draw out the unfamiliar from the familiar. A simple reveal of the human fingerprint of being.The series, dances for small spaces, was born from a desire to use the medium of film as tool for creating and altering a works substance in ways that only media based art can. From the first to the last moment, the medium of film is used as a means of actively interacting with both the location’s architecture and the movement’s kinetic potential. This merging of influences inevitably leads to a dialogue between the camera, environment and choreography, which naturally extends shared control of the creation and direction of work.